We experimentally report on the preservation of transverse spatial coherence in the storage of double light pulses by using a solid. Under electromagnetically induced transparency, two probe pulses are stored into atomic coherence between ground-state levels and later retrieved. By analyzing the Young-type spatial interference patterns formed by two probe fields before and after the storage, we demonstrate that transverse spatial coherence of the probe fields is preserved in the storage process. This demonstration can be used for image processing and multiple information manipulation. M. Fleischhauer and A. Imamoglu, “Electromagnetically induced transparency: optics in coherent medium,” Rev. Mod. Phys. 77, 633–673 (2005). M. Fleischhauer and M. D. Lukin, “Dark-state polaritons in electromagnetically induced transparency,” Phys. Rev. Lett. 84, 5094–5097 (2000). C. Liu, Z. Dutton, C. H. Behroozi, and L. V. Hau, “Observation of coherent optical information storage in an atomic medium using halted light pulses,” Nature 409, 490–493 (2001). K. S. Choi, H. Deng, J. Laurat, and H. J. Kimble, “Mapping photonic entanglement into and out of a quantum memory,” Nature 452, 67–71 (2008). J. Appel, E. Figueroa, D. Korystov, M. Lobino, and A. I. Lvovsky, “Quantum memory for squeezed light,” Phys. Rev. Lett. 100, 093602 (2008). L. Karpa, F. Vewinger, and M. Weitz, “Resonance beating of light stored using atomic spinor polaritons,” Phys. Rev. Lett. 101, 170406 (2008). A. MacRae, G. Campbell, and A. I. Lvovsky, “Matched slow pulses using double electromagnetically induced transparency,” Opt. Lett. 33, 2659–2661 (2008). H. H. Wang, Y. F. Fan, R. Wang, L. Wang, D. M. Du, Z. H. Kang, Y. Jiang, J. H. Wu, and J. Y. Gao, “Slowing and storage of double light pulses in a Pr3+:Y2SiO5 crystal,” Opt. Lett. 34, 2596–2598 (2008). M. J. Lee, J. Ruseckas, C. Y. Lee, V. Kudriasov, K. F. Chang, H. W. Cho, G. Juzeliunas, and I. A. Yu, “Experimental demonstration of spinor slow light,” Nat. Commun. 5, 5542 (2014). D. S. Ding, J. H. Wu, Z. Y. Zhou, Y. Liu, B. S. Shi, X. B. Zou, and G. C. Guo, “Multimode image memory based on a cold atomic ensemble,” Phys. Rev. A 87, 013835 (2013). R. A. de Oliveira, D. Felinto, and J. W. R. Tabosa, “Nonlinear coupling between two Zeeman coherence gratings stored in cold atoms,” Phys. Rev. A 88, 023844 (2013). M. Shuker, O. Firstenberg, R. Pugatch, A. Ron, and N. Davidson, “Storing images in warm atomic vapor,” Phys. Rev. Lett. 100, 223601 (2008). G. Heinze, A. Rudolf, F. Beil, and T. Halfmann, “Storage of images in atomic coherences in a rare-earth-ion-doped solid,” Phys. Rev. A 81, 011401 (2010). 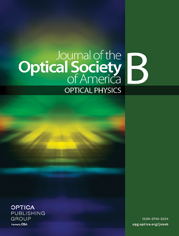 P. K. Vudyasetu, R. M. Camacho, and J. C. Howell, “Elimination of the diffraction of arbitrary images imprinted on slow light,” Phys. Rev. Lett. 100, 123903 (2008). D. S. Ding, Z. Y. Zhou, B. S. Shi, and G. C. Guo, “Single-photon-level quantum image memory based on cold atomic ensembles,” Nat. Commun. 4, 2527 (2013). D. S. Ding, J. H. Wu, Z. Y. Zhou, Y. Liu, B. S. Shi, X. B. Zou, and G. C. Guo, “Multiple image storage and frequency conversion in a cold atomic ensemble,” Phys. Rev. A 87, 053830 (2013). A. Grodecka-Grad, E. Zeuthen, and A. S. Sorensen, “High-capacity spatial multimode quantum memories based on atomic ensembles,” Phys. Rev. Lett. 109, 133601 (2012). Y. W. Cho, J. E. Oh, and Y. H. Kim, “Diffusion-free image storage in hot atomic vapor,” Phys. Rev. A 86, 013844 (2012). Y. F. Chen, Y. C. Liu, Z. H. Tsai, S. H. Wang, and I. A. Yu, “Beat-note interferometer for direct phase measurement of photonic information,” Phys. Rev. A 72, 033812 (2005). J. C. Lee, K. K. Park, Y. W. Cho, and Y. H. Kim, “Preservation of spatial coherence of an optical pulse in atomic vapor quantum memory,” Phys. Rev. A 88, 043824 (2013). R. Pugatch, M. Shuker, O. Firstenberg, A. Ron, and N. Davidson, “Topological stability of stored optical vortices,” Phys. Rev. Lett. 98, 203601 (2007). Z. H. Zhai, Z. X. Li, J. J. Xu, and G. Q. Zhang, “Transfer and computation of optical topological charges via light pulse buffer memory in an electromagnetically-induced-transparency solid,” Phys. Rev. A 88, 035807 (2013). M. Nilsson, L. Rippe, and S. Kroll, “Hole-burning techniques for isolation and study of individual hyperfine transitions in inhomogeneously broadened solids demonstrated in Pr3+:Y2SiO5,” Phys. Rev. B 70, 214116 (2004). J. J. Longdell, E. Fraval, M. J. Sellars, and N. B. Manson, “Stopped light with storage times greater than one second using electromagnetically induced transparency in a solid,” Phys. Rev. Lett. 95, 063601 (2005). G. Heinze, C. Hubrich, and T. Halfmann, “Stopped light and image storage by electromagnetically induced transparency up to the regime of one minute,” Phys. Rev. Lett. 111, 033601 (2013). H. H. Wang, X. G. Wei, L. Wang, Y. J. Li, D. M. Du, J. H. Wu, Z. H. Kang, Y. Jiang, and J. Y. Gao, “Optical information transfer between two light channels in a Pr3+:Y2SiO5 crystal,” Opt. Express 15, 16044–16050 (2007). Y. S. Kim, O. Kwon, S. M. Lee, J. C. Lee, H. Kim, S. K. Choi, H. S. Park, and Y. H. Kim, “Observation of Young’s double-slit interference with the three-photon NooN state,” Opt. Express 19, 24957–24966 (2011). B. S. Ham, M. S. Shahriar, M. K. Kim, and P. R. Hemmer, “Frequency-selective time-domain optical data storage by electromagnetically induced transparency in a rare-earth-doped solid,” Opt. Lett. 22, 1849–1851 (1997). F. Beil, J. Klein, G. Nikoghosyan, and T. Halfmann, “Electromagnetically induced transparency and retrieval of light pulses in a ∧-type and a ∨-type level scheme in Pr3+:Y2SiO5,” J. Phys. B 41, 074001 (2008). Fig. 1. Coupling scheme of Pr ions. Powers of the control, probe-1 and probe-2 fields are 14 mW, 0.5 mW and 0.5 mW, respectively. Fig. 2. Experimental setup of the storage of double light pulses. L, lens; PD, photodiode; BS, beam splitter. Fig. 3. (a) Experimental demonstration of the slowing of two probe pulses. (b) Young’s spatial interference patterns of two probe pulses before the storage. (c) Intensity distribution of the interference patterns. Fig. 4. (a) Storage and retrieval of two probe pulses for a storage time of 6 μs, 12 μs and 18 μs. (b) Young’s spatial interference patterns of two retrieved pulses after the storage and their associated intensity distribution for three different storage times. Fig. 5. (a) Retrieved intensity of two probe pulses versus the storage time. (b) Interference visibility versus the storage time.